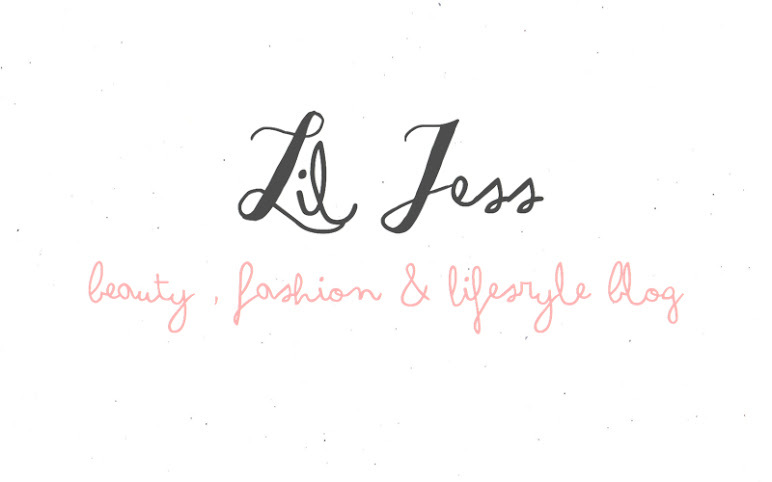 It feels like forever since I last sat down and typed away on my little blog, but I'm now back and ready to type till my hearts content. I thought I'd share with you a few products that I'm using this very gorgeous July and give you some summer vibes. One thing that I love about summer is that I can switch up my routine and explore the beauty department even more than I already do. 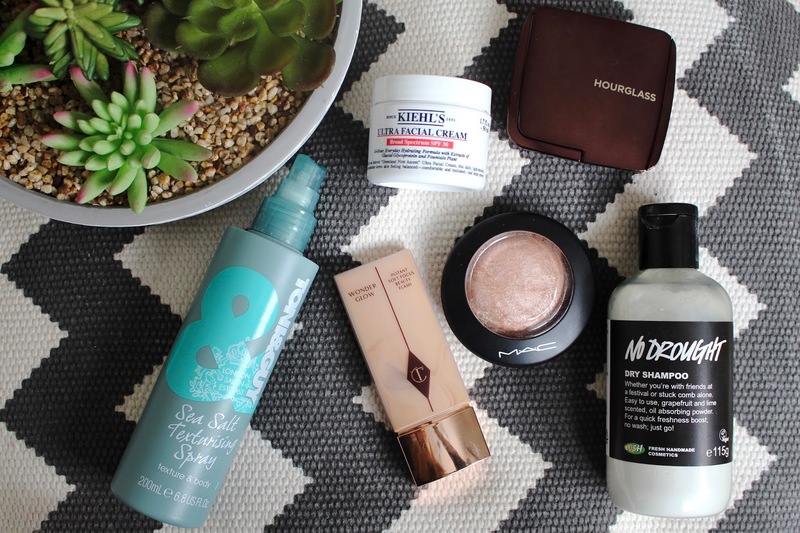 So here are a few products that are getting me through this summer. Kiehl's have just launched one of my favourite moisturiser the ultra facial cream with SPF 30, and boy I've never been SO happy to slap on a moisturiser in all my life. I'm lazy when it comes to applying SPF so this has saved me a job, it's slightly thicker than the original moisturiser & smells different. My makeup sits on top of this cream like a dream & I'm so glad Kiehl's have finally made this moisturiser with SPF. Summer wise this is fabulous and really hydrates your skin but also protects it at the same time, I would highly recommend this one especially for this summer. 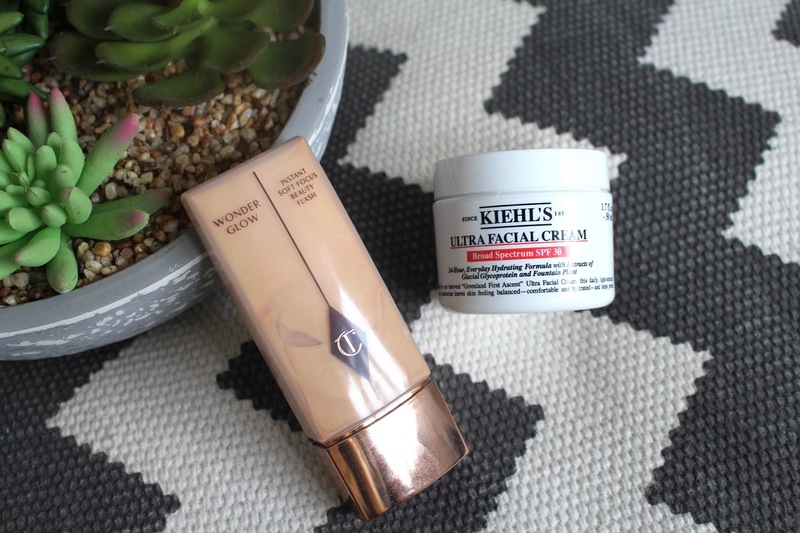 You can't start summer without gorgeously dreamy & glowing skin & Charlotte Tilbury's Wonder Glow Primer does just that. It's a stunning Light Reflecting Primer that I simply love, it instantly hydrates my skin and gives it this lit within luminosity & really awakens my casper skin. It's just an instant hydrate, wake & plump skin dream in a bottle, it makes my skin look & feel SO healthy, I honestly would recommend this product to anyone it's just beautiful and well worth the hype & money. I'm very much about dewy glowing skin this summer and two products that I'd recommend are the Hourglass Lighting Powder in Luminous Light & of course MACs Mineralise Skin Finish In Soft & Gentle. Hourglass products are beautiful, very creamy, easy to blend and give the most beautiful glow & lift to your skin, the lighting powder in luminous light is my favourite one, my skin looks so healthy and I've noticed a huge different in how my makeup looks in photos when I use this, a lot of people who I know keep saying my skin looks really healthy & flawless, I honestly feel like it's down to this product alone. It just gives you a soft focus candlelit glow & adds a bit more dimension to my face. I'm just obsessed with it, very finely milled and my makeup looks nicer & lasts longer when I use this. MAC Minrelized Skin Finish (MSF) in Soft & Gentle, everyone & their mum owns this it's SOOOO pretty, this stunning bronzed highlight is something that I've used religiously & always pull it out of my makeup draw this time of the year. At the moment it's just a permanent staple in my makeup bag that I won't be parting with anytime soon. 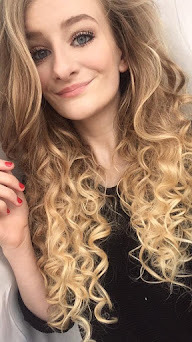 When it comes to styling my hair in the summer it's either a messy bun, down and wavy or in a pony tail however on the days where I want squeaky clean beach wavy hair I love nothing more than using my Lush No Drought Dry Shampoo along with my Toni & Guy Sea Salt Spray. Lush's dry shampoo is one of the best on the highstreet my hair can't get enough of this stuff it's citrus scented & really absorbs the oilyness on 3rd day hair. 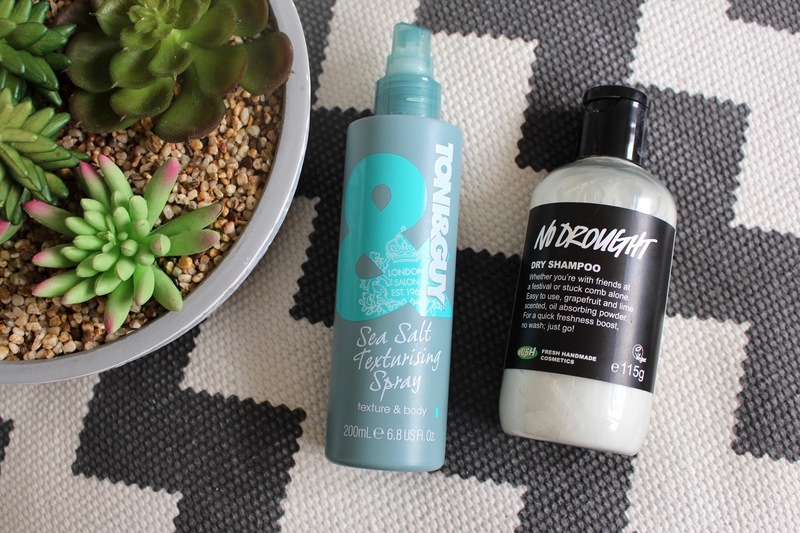 Toni & Guy Sea Salt Spray is something I've talked about on my blog multiple times it's my favourite hair product ever, instant beachy waves for them summer days, be sure to carry your hair brush with you though sea salt means knotty hair. What are you summer essentials? It seems to have been a while since I’ve actually sat down and typed a blog post, so today I thought I would type my June Favourites. Some favourites you will have seen before and some are new to me. One thing you may or may not know about me is that I am a huge lover of good body moisturisers, as when it comes to moisturising my body and actually helping my dry skin I’m a lazy so & so. However one product I have been loving hugely is a hand & body lotion from Lush called Sympathy For The Skin. This is the perfect body lotion for somebody who isn’t a fan of scented lotions & potions, It’s really moisturising, extremely light and soaks in beautifully into your skin. I love how it doesn’t feel oily and smells light. It’s packed with bananas, cocoa butter & sweet vanilla pod infusion. In other words heaven in a tub. Sticking with Lush another product of theirs that I have been loving this month is the No Drought Dry Shampoo, I’m a batiste girl at heart but I have been thoroughly enjoying using this it’s a lot more healthier for your hair compared to batiste, I have found that the smallest amount goes a long way & you really don’t need a lot with this dry shampoo. It’s really lightly scented and doesn’t leave white streaks in your hair. The Body Shop Mojito range is probably one of my faves. I got SO excited when I saw that they were releasing a Mojito themed range including body butters, scrubs ect. Mojitos are one of my favourite drinks however I don’t drink so I always have a mocktail one. As you have probably guessed it smells exactly like your classic mojito it’s fresh fruity & just screams summer. I’ve really been loving this. 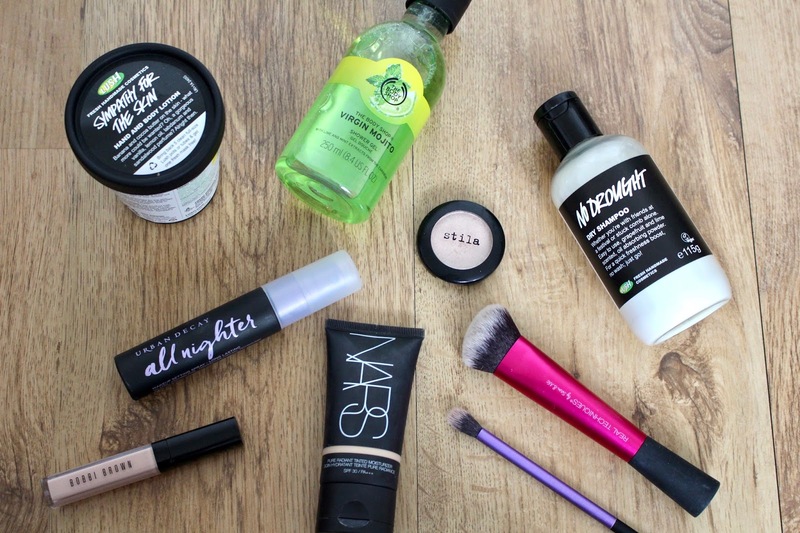 Makeup wise there are a fair few things, one being my Nars Tinted Moisturiser I’ve done a proper review of that here so I will not bore you. Urban Decay All Nighter Makeup Setting Spray is one product I have a love hate relationship with, love the actual product itself but I HATE the smell it makes me gag ever so slightly. My makeup stays longer and looks a lot nicer when I use this, instead of my face of the day slipping off by the late afternoon it lasts me to infinity & beyond when I use this, it’s hydrating and doesn’t feel sticky or sit uncomfortably on top of your skin. All in all I do love it just wish they’d change the smell. The Bobbi Brown Tinted Eye Brightener is something I’ve talked about a fair bit already and it’s because it really is amazing, I feel like everyone should own one of these, I put this underneath my concealer and it really brightens my horrid dark circles & hides them completely, it makes your eyes look awakened and hydrated instead of tired and lifeless. When it comes to eyeshadows we all know how much I love a neutral shade so when I saw Stilla had finally launched one of my all time favourite shades which is Kittens into a single individual eyeshadow pot I had to get my hands on it, It’s this pretty neutral whitish pinky toned shadow that goes with any eye makeup, from a simple wash all over the lid to the inner corners of your eye it’s fabulous. It works really nicely with a simply winged eyeliner look too. 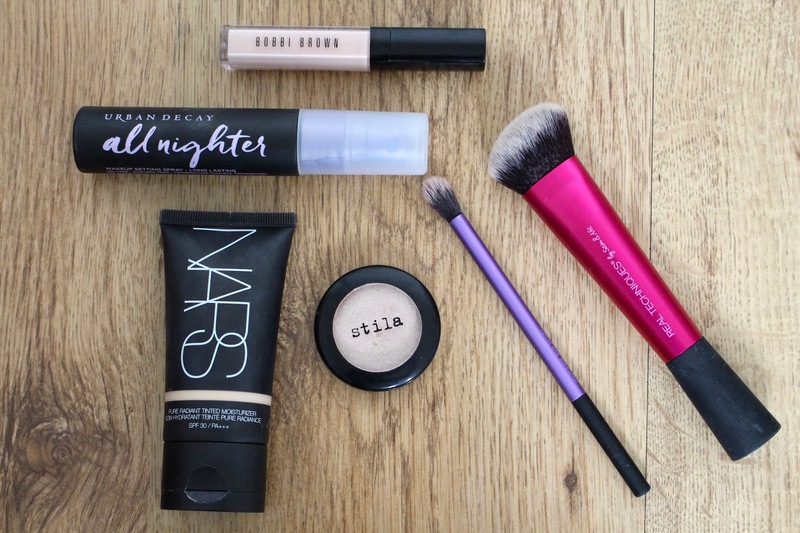 Brush wise there have been two stand out favourites this month. One is my Real Techniques Sculpting Brush I have been loving this brush for foundation it buffs it in beautifully leaves a flawless finish and makes foundation application an utter walk in the park. The other brush is again from Real Techniques & it’s the multitask eye brush, I use this one daily to blend in my Bobbi Brown Tinted Eyebrightener, this brush I don’t actually use for eyeshadow I use it for either my correctors or concealers or on spots it’s a nifty brush that I simply can’t live without now. That is everything I have been loving this past June. What products or things have you been loving this past month?